Hewlett-Packard (HP) announced the release of several exciting new products today, including new desktops and notebooks for both professionals and consumers. Continuing in the direction in which the company has been going, these new models are sleek, stylish and equipped with many advanced features, such as Beats Audio, HP TrueVision webcams and a choice of Intel or AMD processors. Let’s take a look at some of the innovations HP has in store for the near future, beginning as soon as late October. The HP Spectre is a very nice looking ultra-thin all-in-one desktop with a 23-inch flush glass display, 3rd Generation Intel processors and an optional solid-state drive. Perhaps most impressive of all, it features near field communication (NFC) technology that allows easy wireless sharing of photos, contacts, websites and more, all with a simple tap of the touch-sensitive screen. In fact, the Spectre can be used in conjunction with a user’s smartphone or tablet, which then becomes like a remote control for the computer’s operation. The Spectre is expected to be available in the United States on November 14, at a starting price of $1,299. 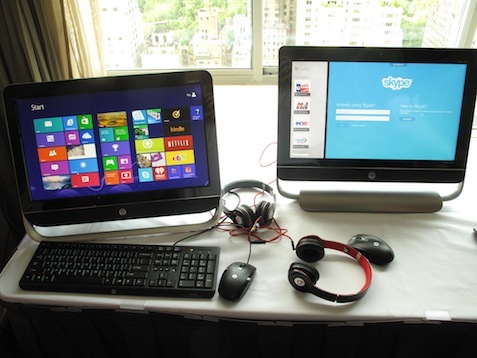 The HP ENVY 20 and ENVY 23 TouchSmart PCs and the HP Pavilion 20 All-in-One PC also feature this technology, and will be available in the United States on October 23, at even lower starting prices. These devices are all a step up from traditional non-mobile units in that they provide connectivity with mobile devices the consumer may already have. Some of the most impressive new devices announced by HP today are its notebooks, the HP ENVY m4 Notebook, and the HP Pavilion Sleekbook 14 and 15 PCs. The latter are especially nice-looking, in sparkling black or ruby red finishes, with super-slim, lightweight design. They each weigh under four pounds and measure only 21 mm thick, and at a starting price of under $500, they offer many of the same features as most $1,000+ models. The HP ENVY m4 Notebook, on the other hand, features faster renders and more powerful graphics than the Sleekbook series, as well as a few very innovative HP exclusive features. CoolSense is a new development from HP that keeps the exterior of the notebook cool during extended use, and SimplePass is an extraordinary new security technology that uses fingerprint identification instead of typed passwords. In fact, each of a user’s fingers can be programmed to a different website, if the user so desires. For example, your index finger could bring up Facebook, while your middle finger accesses YouTube, etc. With these and other cutting-edge devices, it is easy to see why HP remains on top of the game for both professional and consumer electronics. Hewlett-Packard (HP) previewed a number of exciting new products on the evening of Tuesday, August 27, most of which will be available in December of this year or January of next year. Unfortunately, there is a non-disclosure agreement in place until Thursday, September 20, for many of these products, so tune in on that day to find out more. For now, though, let’s take a look at three impressive new laptops offered by HP. The HP Spectre TouchSmart Ultrabook is a sleek, stylish, 4.77 pound notebook with a 15.6-inch screen featuring edge-to-edge glass. It is a multitouch touchscreen device that also features a fully functioning keyboard and a full array of ports, including Gigabit Ethernet, USB 3.0, and HDMI. 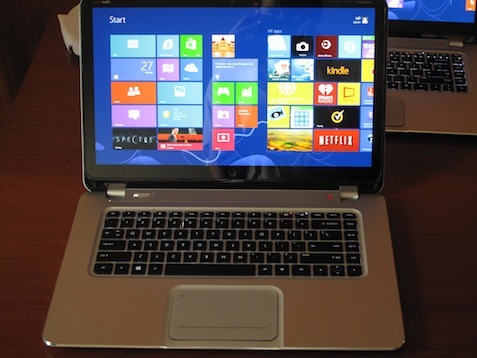 It is also HP’s first notebook to feature Intel Thunderbolt technology, a new technology similar to FireWire, but not based on it. Also used by Apple, Intel Thunderbolt allows for high-speed connectivity and daisy chaining of multiple devices. 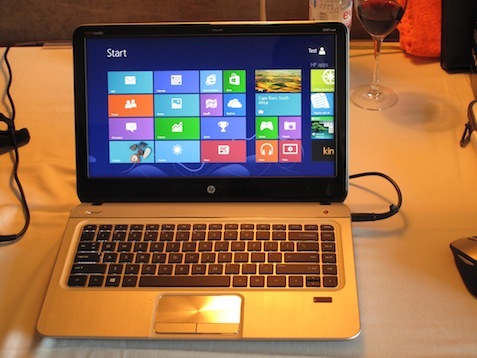 The slightly smaller HP ENVY TouchSmart Ultrabook 4 features a 14-inch multitouch HD display with a backlit keyboard and a subwoofer featuring Beats Audio. It delivers up to eight hours of battery life and, like the Spectre Ultrabook, is expected to be available in the United States in December, with a starting price of $1,399. The HP ENVY x2 takes the touchscreen and keyboard synergy of these devices to a whole new level. The ENVY x2 is a tablet and a laptop at the same time, with a detachable 11.6-inch diagonal HD touch display featuring IPS technology. It has a sleek aluminum finish and an innovative hinge system with magnets that smoothly guide the tablet portion into place with the keyboard, which, when opened, wedges up from the table or other surface on which it rests, providing a more convenient angle for typing. The ENVY x2 features Beats Audio, NFC technology and an optional stylus, as well as two different types of cameras for its two different operational modes: an HD webcam on the front and an 8.0 megapixel camera on the back. It is also expected to be available in December. With these and other devices previewed recently, HP continues to move in the direction of thinner, lighter laptops without sacrificing its many innovative features. Don’t forget to check back with us on September 20 to see what other exciting new products HP has in store.